The InterContinental brand is one that I go to if I need a ‘fool-proof’ stay. Sometimes, you tend to feel experimental. Other times, you just want to fall into the familiar TLC arms of a hotel brand that feels like slipping into warm, comfortable slippers. Where you know that everything will be taken care of. 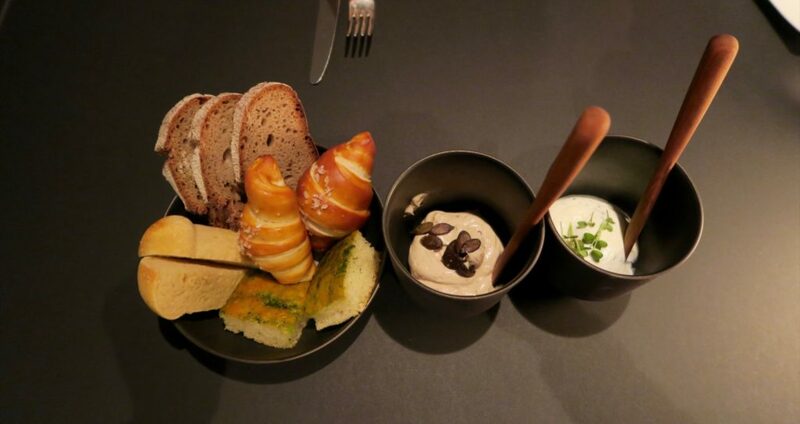 My stay at the InterContinental Berlin further solidified my feelings about the brand, if not even more as it left me extremely impressed with its service and food. 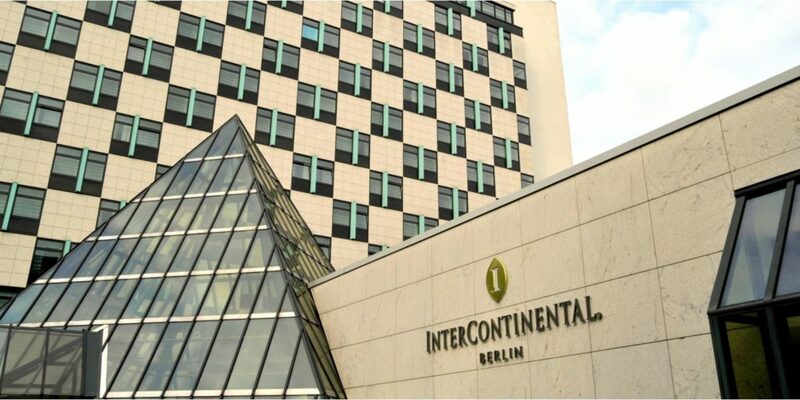 Located in the crossroad of Berlin Mitte and City West, the InterContinental Berlin is a great place to stay if you want to get a bit of a local feel in the city. It is only a 25 minute drive from Berlin Tegel Airport (TXL). It is also close to the Tiergarten (it was the view from our room window). The zoo is also a close walk, and on the opposite side of the zoo is the Kurfürstendamm shopping street, where the high end KaDeWe department store is located. Now I rarely take the bus (as I’m intimidated by the complexities of it, especially if I’m only in a city for a short time), but the supreme location of the InterContinental Berlin changed that for me. The stop for Bus 220 is just across the hotel, and that bus can take you around the main areas of Berlin, and on return, Bus 200 will literally drop you in front of the hotel, it feels like you just took a cab. The Zoologischer Garten is the closest train station, a 10 minute walk from the hotel. The day we checked in was the day before a huge major nationwide logistics and expo conference was to happen in the hotel. Save for the few external staff setting up the gear in preparation for the event, you would not even know that a major conference was to happen the next day. Check-in was extremely organised and efficient. There were other guests yes, but no one had to line up. Our room was an Executive / Deluxe King Room category. 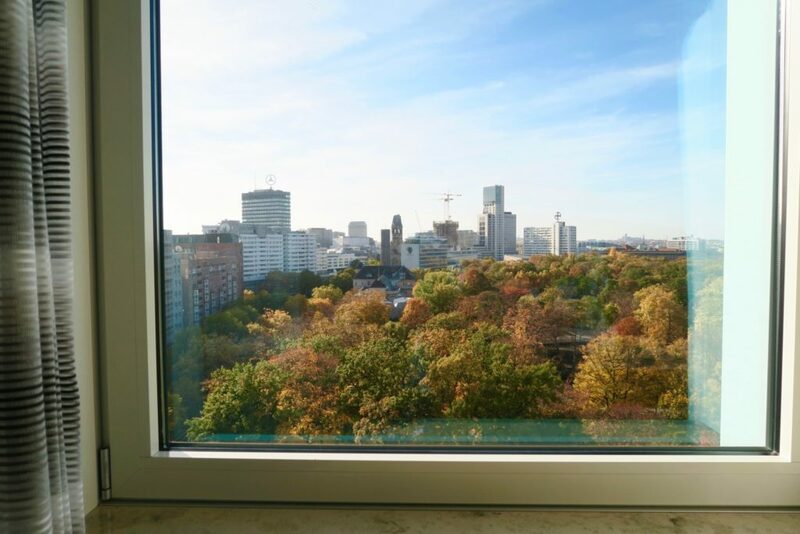 It was on the 10th floor, with sweeping views of the Tiergarten. I really liked the rather new and modern design that is quite unique to most InterContinental properties. The main colour / theme of the room was red, pearl grey, black and white. 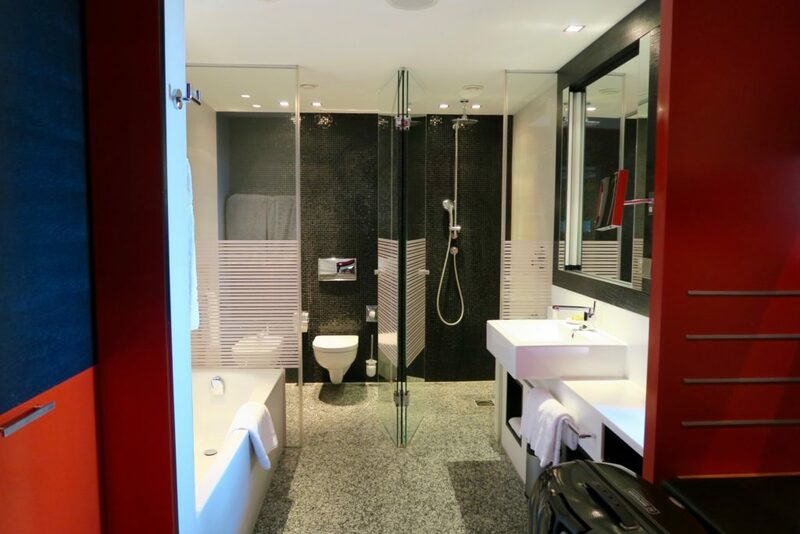 Uniquely accented in red, grey and black, the bathroom was spacious, had and is attached to the walk-in dressing and wardrobe area. There was also ample space for huge suitcases, so it was great to not have (or even see) bags in the main area of the room. This was also a strategic place to have luggage storage because you don’t need to keep stepping in and out of the bathroom to get changed or get your personal items ready. 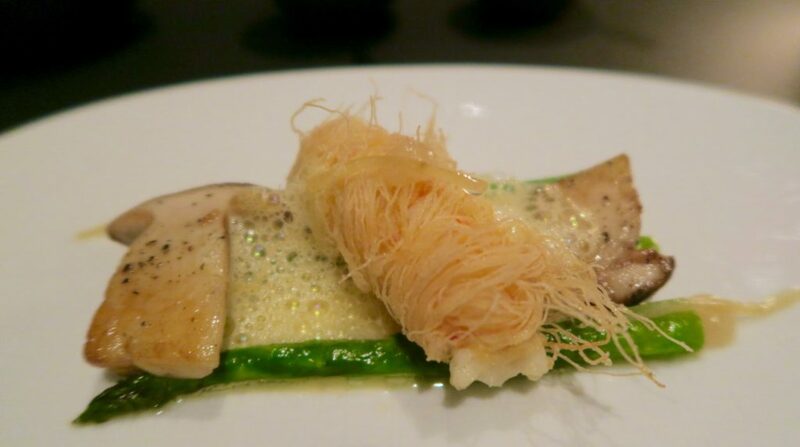 InterContinental Berlin is also home to a One Michelin Star restaurant, Hugos. 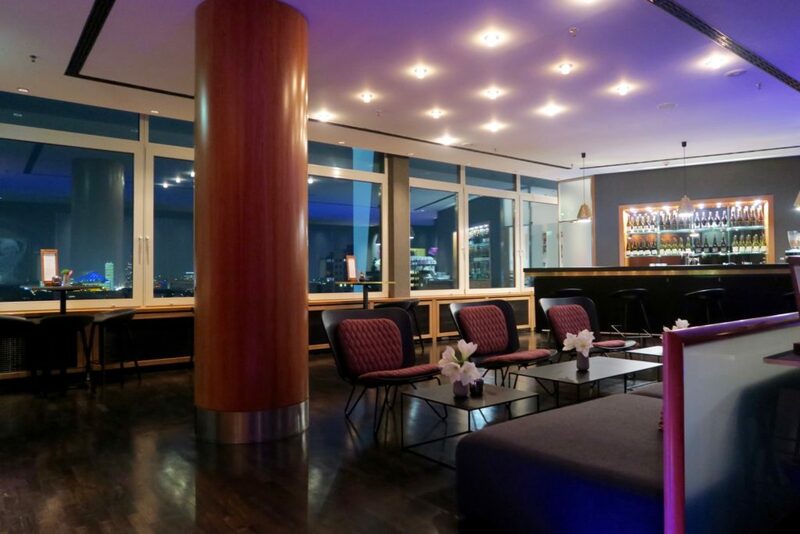 It sits on the 14th level of the hotel and overlooks Berlin. While this restaurant is normally open only during evenings, we had breakfast here on our first morning, due to the normal breakfast restaurant being used for the conference that was happening while we were there. Even though it was only one morning of all guests having breakfast at Hugos, they really created a full spread buffet, and you wouldn’t even feel that it was only a temporary set-up. It was also on this morning that the service really amazed me. I’m not normally a breakfast person (and even on days I have breakfast, I only really have very little, like oatmeal or muesli). Zombie on the other hand, loves breakfasts. So it’s a normal morning scenario for us to have him go for breakfast early in the morning, while I either a.) sleep -in or b.) take my time getting ready for the day. I sometimes join him and catch the tail-end of his breakfast. I did so on that morning, and as I looked around the buffet set-up, I remarked that it’s impressive that they even had an Oriental buffet area set up (among other types of breakfasts), considering that this was only for one day. And Zombie said it was a pity that he missed out on it because when he arrived, the dim sum selection was gone. And while he would have wanted to try the dim sum, he happily went with the other breakfast varieties that were on offer. Breakfast is served until 10AM, and this was around 9:45. We planned to leave at 10AM sharp because we had a tour to catch. As we stood up to leave, one of the waiters came over to tell us if we could sit and wait as they informed the kitchen to bring in more dim sum! And we were obviously surprised because we never even asked (nor hinted) for dim sum! We unfortunately could not afford to wait (as much as we wanted dim sum breakfast!) as we would miss our tour if we left any later than 10 AM. 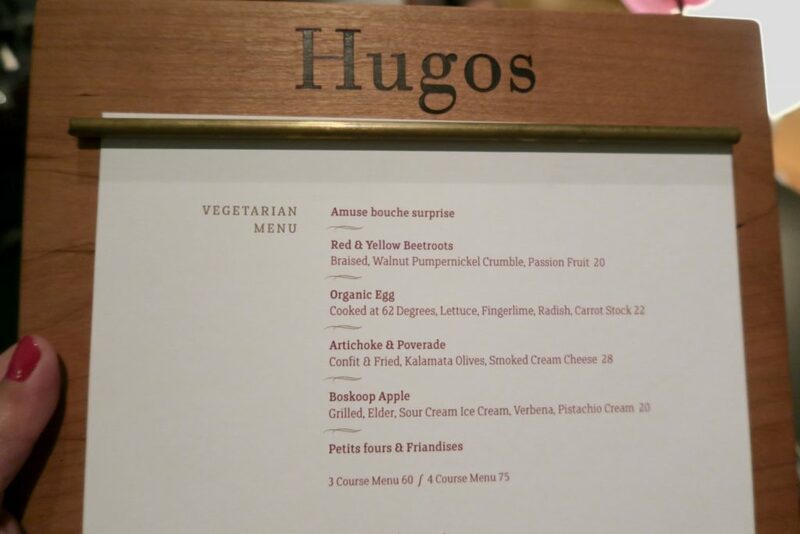 At the end of the day, we had dinner at Hugos, after our activity-filled day. It was a different scenario in the evening, much more romantic with dim lights. 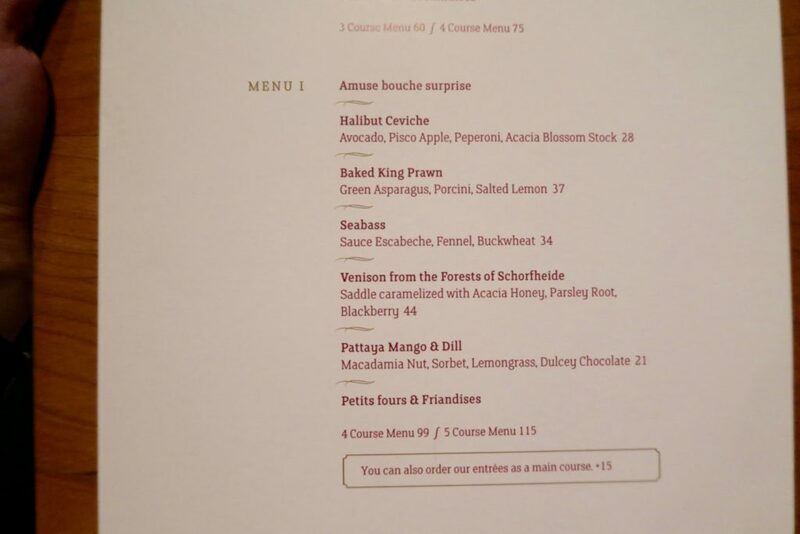 Their dinner menu that night was pleasantly straightforward, which I really loved. You all know I’m a “simple” eater and this is totally my type of menu organisation. This is just two of the Menu sample / suggestions that evening. There was also one for meat eaters (which Zombie had), and you can also mix and match any of the dishes. On our second morning, breakfast was back at the regular restaurant, L.A Cafe. 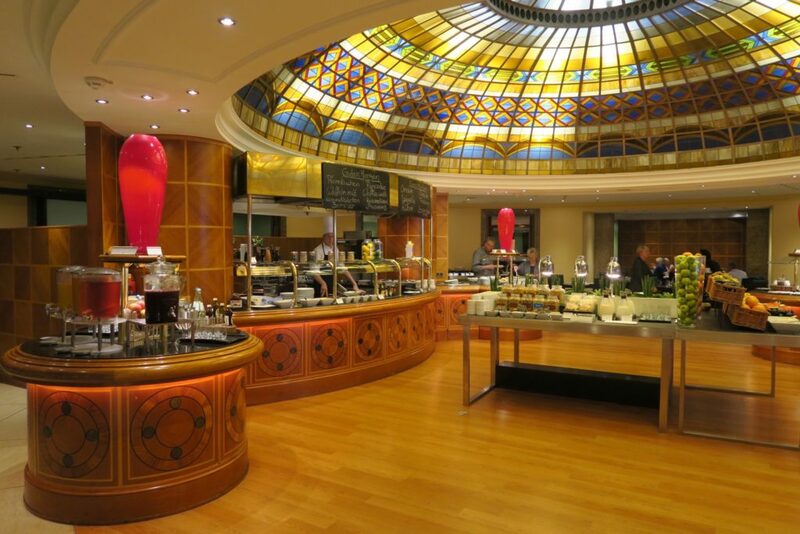 Breakfast really is a big affair at the InterContinental Berlin. There was an area for hot breakfast requests (to call this an omelette station would be an understatement) and also ample offers of cereals, oats, breads and fruits. Fellow blogger and travelista Kelly from Around the World in 80 Pairs of Shoes (oh yes she does 😉 also had a fantastic experience at the InterContinental Berlin, and she was highly impressed with their gluten-free friendly menu and offerings. Two big nods to the F&B service (and food itself) of InterContinental Berlin : one from Kelly, the queen of afternoon teas and one who’s had very many hits and misses with gluten-free (or gluten-full) hotels and restaurants around the world. Another one from yours truly, whom you may have now suspected is a very picky eater (I’m pescetarian, have been for 9 months and counting now, and also like simple food). Big hats off to the F&B team of InterContinental Berlin. I cannot recommend their breakfast and dinner enough. I enjoyed my stay at the InterContinental Berlin, and I’m glad that I was able to spend my last 2 nights in the city here. 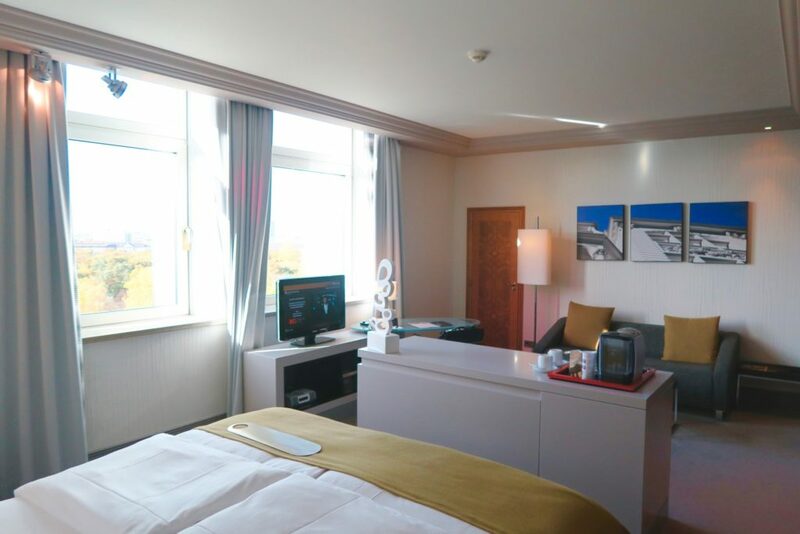 The extremely transport-friendly location of the hotel makes it a great base for those who are in Berlin for business, but the close proximity of the hotel to the shops, Tiergarten and the Zoo will also be thoroughly enjoyed by tourists and families. Food is something that’s close to heart to many of us. 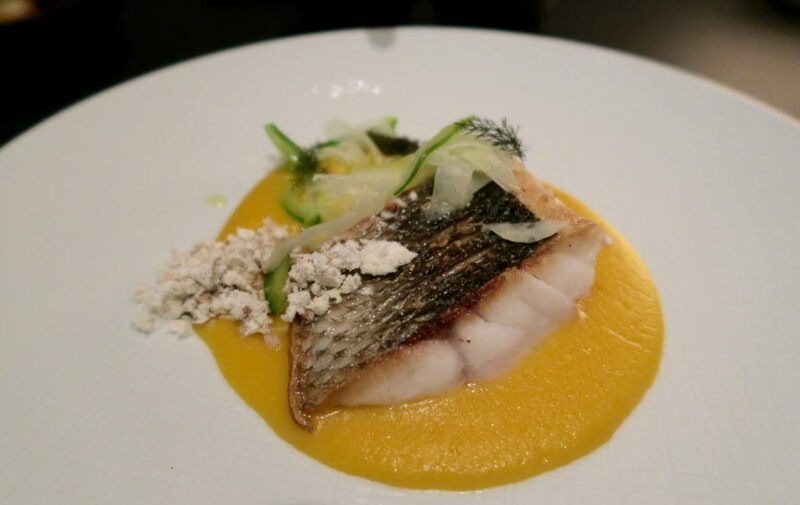 While our tastes in food are subjective and different, have you ever come across an establishment (be it a hotel or restaurant) that had impressive service? 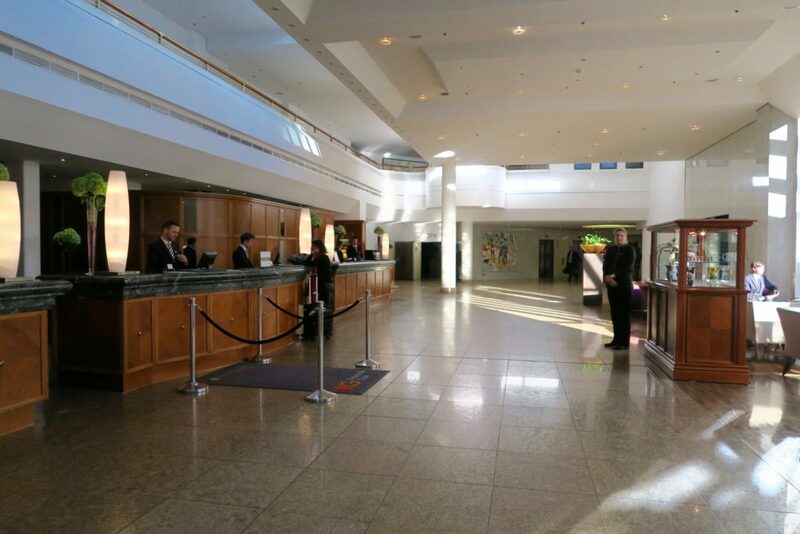 We stayed as guests of InterContinental Berlin for the purpose of a review. Ah, I love a good hotel breakfast. I think the best hotel breakfast I’ve ever had was in Singapore in what used to be the Raffles Plaza hotel. It had sparkling wine, the most amazing juice station, an outsize egg station and all the deli meats were carved off the bone. I’ve had some cracking hotel breakfasts since, but nothing can top that! The Intercontinental looks wonderful and the service sounds like six star! I would totally love to eat that vegetarian meal! This hotel sounds terrific and is now noted… being so central and by the Zoo and park would suit me so well! Yes its so refreshing to see a full course menu that won’t leave you too stuffed, as is most the case for these types. Indeed, this Intercontinental is very family friendly but also great for business! Kelly! I just got the welcome pack 😉 hehe! How amazing is their service and not only catering to your gluten intolerance, it sounds like they threw a party for it too!